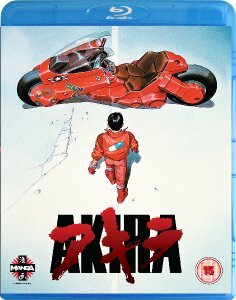 myReviewer.com - The Summer of Akira is Here! Blu-ray, DVD, Cinema, and TV! "AKIRA IS THE DEFINITIVE ANIME CLASSIC." - EMPIRE: THE 500 GREATEST MOVIES OF ALL TIME. To coincide with the company's 20th anniversary celebrations, in June 2011 Manga Entertainment will be releasing on Blu-ray, for the first time ever, the movie that started it all and defined the Manga brand as the world's leading anime distributor - Katsuhiro Otomo's classic Akira! Prior to the Blu-ray release, the film will also open at selected UK cinemas, giving fans the chance to see this "lavish animation extravaganza" (Variety) in all its big screen glory. Universally acclaimed as one of the greatest anime features of all time and hailed as "a visionary, game-changing masterpiece" (News of the World), the film has been digitally restored and remastered in full HD with super dynamic "Hypersonic" audio especially for this long-awaited Blu-ray release. Acknowledged as a hugely influential and genre-defining anime, this is Akira as never seen or heard before. An unmissable treat for its established legion of admirers, this release is set to introduce Otomo's masterpiece to a whole new generation of film fans. "A remarkable technical achievement in every respect" (Variety) and packed from start to finish with "scintillating animated visuals" (Empire), Akira "moves with such kinetic energy that you'll be hanging on for dear life" (Washington Post) and remains, 20 years on from its first UK release, "a landmark production that can be watched with equal satisfaction as a metaphorical psychodrama or as a sheer visual spectacular" (The Onion). Akira (cert. 15) will open at selected UK cinemas on 24th June 2011 and will be released on Blu-ray and DVD on 27th June 2011. A special limited edition collectors' SteelBook containing both the DVD and the Blu-ray disc will also be available from 27th June. Anime News Network have a list of cinema screenings where you can see Akira as it was meant to be seen, on the big screen. Akira, the classic anime SF-action film by Katsuhiro Otomo, will be screened by the Picturehouse chain of cinemas in July. One new venue has been announced - the Regal Picturehouse in Heney, which will show the film on Tuesday 26 July at 2030. A portion of the profits from the Picturehouse screenings will go to the Japan Society Tohoku Earthquake Relief Fund. The film will be shown as part of Picturehouse's 'Culture Shock' film season. The screenings will be in Japanese with subtitles. The Anime News Network also report that the new print will also get a broadcast on the satellite and cable channel Syfy on June 25th, with repeats in July. Feature-length animation set in a future Tokyo, where gangs terrorise the city and a sinister government experiment is poised to go horribly wrong. This sci-fi fantasy, directed by Katsuhiro Otomo, takes the viewer into the world of Blade Runner, Mad Max and beyond, and is acclaimed as one of the finest examples yet of the anime genre. According to a twitter post by 'Paradox295,' which was subsequently re-tweeted by Manga Entertainment, Syfy will repeat the film on July 1 and July 30. (Syfy posts its schedule online here, although only the June screening is listed as of writing). According to 'Paradox 295,' the screening on July 1 will be at 2310, and the screening on July 30 will be at 2200. Syfy is a subscription channel, available in standard and HD formats on Sky channel 114 (there's also a +1 service, showing material one hour later, on channel 205). It is also available at the following channels: Virgin 165 (HD), Virgin 135 (standard), Virgin 166 (+1) and Tiscali 22.